B6625 – This is a nice dress for a winter holiday party. The deep pleating gives it some nice structure, and it looks like it would be a great pattern for those heavier formal fabrics like a thick satin or heavy brocade. B6627 – Patterns by Gertie. This is a pretty basic dress but the fringe is a cute idea. I see so many fringe dresses in skating that I forget it’s not an everyday sort of thing in most fashion circles. It’s cute. B6623 – Simple flowy dress that will not let the sleeve trend die. It’s pretty, but it’s nothing really new. B6624 – A fitted sheath with flouncy sleeves. I’m ready for a new trend. B6621 – Interesting gathers and twist details on this knit dress. I really like View A, but I also realize I have several similar patterns in my stash that I like even better, so I I’m tryin to convince myself I don’t need this in my stash too. It’s cute though. B6638 – This is a nice wardrobe pattern. I’m enjoying the use of wax print to create a bold look for the model image. The top and skirt are actually really cute, and the jacket is interesting, since it is fitted in the front but loose in the back. B6637 – I really like the View A top in this pattern; I’m all about asymmetric hems at the moment. The other styles are things that would look good on me, but I don’t know if I need them in the stash. The other tops are the same sleeve trends we’ve been seeing, and the pants are nothing new, but I do like that first shirt. B6622 – Jumpsuit/dress with fun back detail. I like a lot of these variations, and I think these could easily be spiced up to create a cool holiday party look too. B6636 – Ok, so I think the styles of this wardrobe pattern are pretty basic, but obviously the more exciting thing here is the model! I think we are all aware that inclusivity is a problem with most major pattern brands, but it’s nice to see that efforts are being made. I also think it’s great to showcase the pattern in this way. Normally I’d ignore it as being fairly unoriginal, but I’ve stopped to consider this pattern more heavily because it has been given different context. Possibly that says more about the state of our culture at the moment than it does anything about the pattern itself, but I did think it was worth noting. B6626 – Lisette. The Lisette patterns always have nice clean lines and smooth shapes. Simple, but elegant. B6628 – I’m selfishly happy that draped details are looking to be the next major trend. I’m sure we’ll be sick of it in a few months time, but these sorts of details work well for me, so I’km going to enjoy it. B6631 – I’m not as excited about this draped top. The proportions just feel a bit off. B6632 – Fairly basic peasant blouse. B6629 – I’m more intrigued with this top; the angular hem is an interesting detail, and I like the different collar options. B6633 – Katherine Tilton. This looks like a really comfortable top. Lots of potential for fun print combinations as well. B6641 – Lisette. I really like this jacket! It is sleek, but not too fitted, and the collar detail is really nice too. B6634 – Katherine Tilton. This isn’t my favorite silhouette, but I do like the zippered pocket detail. Very practical, and pretty cool! B6635 – I like the shape of this tunic top; the shoulder gathers are nice and the shape of the hem length is great as well. The fun print isn’t hurting either! B6642 – Connie Crawford. This is a nice option for a more tailored, classic coat style, especially if you don’t want a super fitted waist. B6640 – I’m not that excited by this Lifestyle Wardrobe pattern; the styles seem pretty basic, though I do think the idea of using the long shirt dress as a jacket/cover up is a cool idea! B6643 – I know most people are pretty critical of the Big4 corset patterns. I’m not enough of an expert to tell you if this is any better/useful/more accurate than any of the other styles, but I think it very much makes sense to add this to the Gertie line since so many of her styles work best with a 50s wasp-waist silhouette. B6646 – This costume is pretty frilly, but, well, it’s a costume so that’s kinda fun too. I think this could be a good starting point for a lot of cosplays or historical costumes. B6639 – Because of course we need the Meghan dress! It was only a matter of time. Though, honestly, I do think this is a really pretty gown. It definitely could work well for a non-wedding dress too. The following See & Sew patterns are basically re-releases of older patterns, so I don’t have much to comment, but I am including them for completion. And that’s it! On the whole I think there are some nice patterns in this release. Nothing here is really standing out as being something spectacular, but there are lots of practical designs that could work well for a winter/holiday wardrobe. I’m excited to see the trends shifting from sleeve flounces (though there are certainly plenty of those still) towards interesting knotting and draping detail. Hopefully we will see more of this trend moving into the spring styles; I think there are lots of fun ways to utilize this detail. What do you all think? See anything here that really piques your interest? Or is this release a total snoozefest? Feel free to discuss in the comments! Yeah, I feel like we haven’t seen an underbust corset from the Big4 very often. I looked through these yesterday and was having a big yawn and then got super excited when I saw the model on B6636. Of course then they messed it up by giving her a high-low hem, but I guess they get points for at least trying? I was mainly interested in the Lisette jacket which has a great combination of details. I was also really drawn to the shirt/shirtdress wardrobe pattern, but I won’t be buying that one since I have at least 35,000 shirtdress patterns already. I admit I have a problem. Also, I do think that the other styles in that pattern would have made more sense for the model, but, yes, points for effort! I really like a few things in this release – the first dress, 6625 especially view B with the cap sleeves. I also really like 6621 and 6628 for variety of drape/tie dress and top patterns included. The different views make both of these quite good value patterns so I’ll be picking those up in the next sale I think. I’m beginning to think that there’s something wrong with me cause I like nuthin here. Nuthin at all and I haven’t liked anything in any of the last couple of collections from any of BMV. I guess I will have to sew some of those unsewn patterns I own instead. I can totally understand not really liking anything in this release (or the past few TBH). There are things I like, but nothing that has me jumping to open my wallet. When I compare these patterns to my stash, well, my stash is better. And right now I’m waaaaaay more interested in what Burda’s doing in the January issue… which I shall post shortly! As always I always enjoy reading your reviews. This release doesn’t set the world on fire, but it isn’t that bad either. 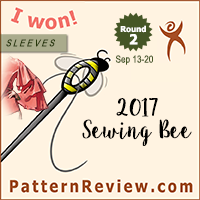 Of course, I am going to write about sleeves, but Butterick seems to have put an end to huge sleeves! There are a couple borderline sleeves, but still. Yay Butterick!! Kudos for the styling of B6636, I honestly never expected to see a Hijab on a pattern envelope. I might buy the pattern, if only to encourage such inclusive behavior. There are a few patterns that I like and couple that I will buy when Fabricland has a sale. BTW, I agree with you about B6631, it looks odd and messy somehow. I think I actually hate it. I have LOVED the sleeve trend. Loved it. Lol! They aren’t practical going into winter in Minnesota but I am definitely still on board. I am a sucker for twist front tops/dresses. I really liked this release. Very solid IMO — dresses, separates, formal, it’s all there. I’m making that Lisette jacket A. S. A. P.!!! That was my favorite style too! Still not a fan of flounces and shaped hems, but I did appreciate the model and the modesty of 6636. The only one that went on my want list was 6644, the men’s pullover shirt, a style much loved by the “psychedelic relic” set. I would have done the cover model in indigo tie-dye and put it on a 60-something guy with a gray beard, ponytail, loose muslin pants, and sandals. Yeah, you’ve seen that guy in the organic produce section of the supermarket. There are some good wearable things here. But I think a some of them are hiding behind bad fabric choices for the samples. 6619 pjs, I’m looking at you. I do like 6628 and 6629 a lot though. And like you I’m glad that draped details are coming back. 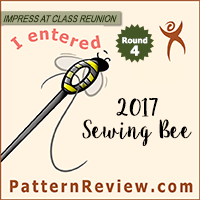 I liked the very first dress – 6625 – I liked it a lot. Then one of my daughters decided it would suit her. Now I can’t imagine myself in it. I’m not really into the Gertie designs. I think part of the reason is that Gertie models her own designs, which is really cool. But I get befuddled when the fabric’s print seems to blend into her tattoos. It blurs the dress’ design lines, and obscures some impressive ink work. I’d like to be able to admire each, separately. Otherwise, not a lot here to make me open my wallet either! I am so into the Lisette dress 6626!! It’s so simple but I like it so much!!! The lines are clean and bold.